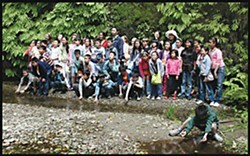 Students from Chengdu, China, posing for a group picture in Fern Canyon last week. Photo by Yulia Weeks. Wu Yulun wants to be a C.E.O. when he grows up. His parents are successful real estate developers in a large Chinese city. His father – already the C.E.O. of his own company – drives a Ferrari, his mother a Maserati. Little Wu has traveled all over the world – from Italy to Singapore. But this is his first time in the United States. A mop of black hair frames the 11-year-old’s dark, round face. He wears a red T-shirt with a big yellow Nike swoosh across the front and the Chinese characters for China – pronounced zhongguo – emblazoned on it. He says he’s going to Beijing later this summer to attend the Olympics with his mom. The story of his family’s success is becoming more commonplace in 21st century China, but it’s still far from the norm. China’s average urban dweller earns a little over 2,000 yuan ($300) a month, not nearly enough to buy an Italian sports car, or even to send one’s child on a two-week trip to America. 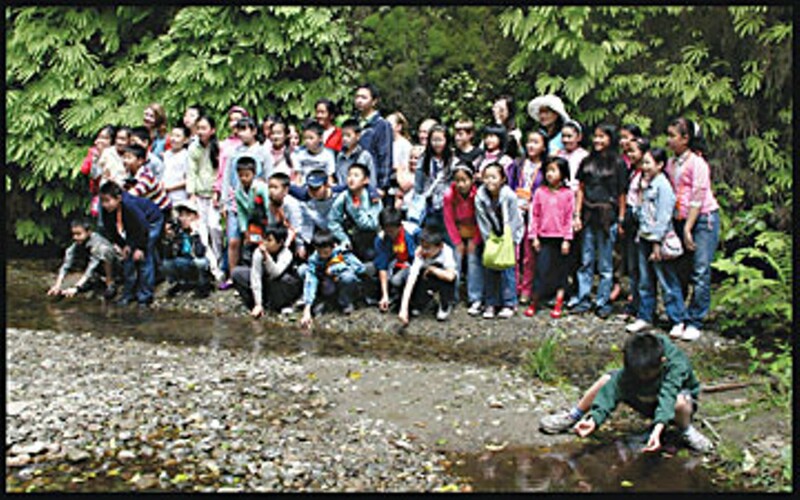 Little Wu is one of 36 primary school-aged students from Chengdu, China, who spent last week in Humboldt County, staying with American host families. Chengdu is the capital of Sichuan Province, the site of a recent, devastating trembler that claimed the lives of almost 70,000 people. While here, the students – all beneficiaries of China’s economic boom – spent their mornings learning English at Union Street Charter in Arcata, and their afternoons dancing hip hop, making masks and putting together mosaics. Little Wu wasn’t the only kid along for the ride. Yuan Huating, 10, told us he wants to be an engineer when he grows up. And Hu Jiangshan, also 10, announced proudly that he wants to be a cop. There were surprises in store for Reneau as well. The students’ arrival date was bumped up at the last minute; programs planned for elsewhere were consolidated into this one; and Reneau found out, only after the students had arrived, that when their week of cultural synergy in Humboldt County was over, they were headed into the very jaws of consumer temptation from which she’d hoped to spare them: Disneyland, Universal Studios, Las Vegas. Diane Korsower, who hosted two boys with her husband, Darius Brotman, for the week, said she wouldn’t have volunteered had she known all the facts about the program beforehand. “The way it was presented was international good will,” she said. But that turned out to be quixotic. In addition to the fact that her two kids, Wang Wentao and Zhao Weilun, didn’t speak much English, she was surprised when she found out they had brought $500 in spending money with them. “What I hadn’t realized is that these are the kids of the elite,” she said last week. Of course it’s not the kids’ fault that their parents are wealthy, and Korsower tried her best to feed them things they liked and to keep them entertained – most of the time that involved lots of sign language and pointing. Last Thursday evening, they were headed to see Wall-E at the Minor Theatre in Arcata. Little Wang, soft spoken, with a round, pale face, told me that he was still homesick. Little Zhao was coping much better. While Little Wang explained how much he missed his mom and Chengdu food, Little Zhao was playing a noisy computer game that involved blowing things up. When I told them that they were going to see Wall-E later that evening, Little Zhao punched his fists into the air excitedly; Little Wang looked downcast – turns out, he doesn’t like cartoons. Ozaki and her husband, Aaron Gottschalk, adopted their daughter from China, and even though 5-year-old Meiwan doesn’t speak any Chinese, she and Little Yang got along great, Ozaki said. A half dozen of the almost 30 host families had adopted children from Asia. Ozaki said she wished she could have shared more local culture with Little Yang, but that was impossible even though her English was better than most. In the end, they did lots of shopping together. Alix Nathan, C.E.O. of NISE, explained last week that bringing primary school-aged children to the States for the two-week trip is valuable because they have fewer stereotypes and are willing to take more risks than their high school-aged counterparts. “They may not process [what they see], but what they get is intangible,” he said. As for why the students all come from wealthy families, Nathan said that’s an unfortunate reality of the U.S. visa process. Having well-established parents in China reduces the risk of illegal immigration, he explained.